All it takes is some mystery to draw folks in sometimes. 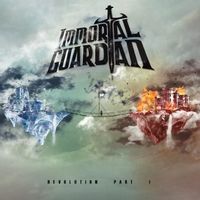 For instance, what is “super metal?” A term that has been floating around the band Immortal Guardian since their onset, it’s a cool way for the band to describe themselves (see the story below) as well as generate some of that ‘need to know’ interest. But with a name like that, the band had better be bringing it or it’s instantly lost. Thankfully, Immortal Guardian have more than enough chops to back up any ‘super metal’ claims. Their first full-length, Age of Revolution, comes hot off the heels of a few shorter releases, and the band was picked up by M-Theory Audio to help really give the band some reach for this occasion. Their combination of extreme styles, from power to prog to even death metal, is one that’s cohesive yet wildly varied. It’s an interesting approach that should find appeal from many in the community. 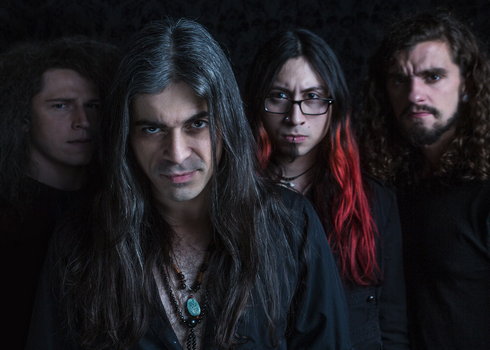 Guitarist/keyboardist Gabriel Guardian spoke to us for a few minutes prior to the album release to give us the details on ‘super metal,’ their recent touring endeavors, and even how he ended up on MTV’s Amazingness. Dead Rhetoric: What does the term ‘super metal’ mean to you? Dead Rhetoric: Do you feel that has helped you avoid being pigeonholed in the power/progressive scene? Guardian: We are all over the place with the sound, and I love it. It’s what gives us a new flavor. Just like other bands, we are beginning to change our sound. With the new one, Age of Revolution, I think we are going to throw a wrench in there so I’m excited to see what people call us after that [laughs]. But I’d definitely still call it super metal. Dead Rhetoric: Age of Revolution is your first full-length. How do you feel it compares to your previous EPs? Guardian: The cool part it is that some songs were written right there and then for the album, like “Zephon” and “Aeolian” and some songs, like “Never to Return” and “State of Emergency” were written when I as 14-15 with our manager Brett [Rivera], as we used to be in a band together as kids, or with our drummer Cody Gilliland before we were in Immortal Guardian, just jamming in high school. So some songs go way back and others were just written, so you are going to hear different parts of my writing style over my career. I think that’s what is going to make it fun. 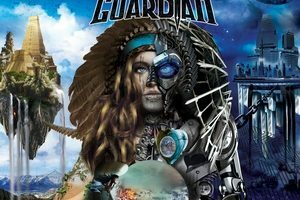 You get to hear the new sounds of Immortal Guardian, but you still get the old vibes too. Dead Rhetoric: How’d you end up with M-Theory for the release? Guardian: It’s something that our manager Brett Rivera had been working on. We had spoken to Clay previously, who works with M-Theory. We had met in the past, and I had heard some awesome things about Marco [Barbieri]. He definitely has a track record of great accomplishments, so we thought that signing with him would be an awesome thing. So far it’s been great. Dead Rhetoric: With the title Age of Revolution, is there a meaning behind it? Guardian: Yes, there is. It goes back to the EP that we released to this album, Revolution Pt I. We wrote a lot on that concept on the EP, and it wasn’t enough to fit on one record, so we made it Pt. I, and Age of Revolution is part II. I think it’s just something you have to hear for yourself. It’s definitely in the theme of revolution of all different kinds. Dead Rhetoric: You mentioned you filled-in for Powerglove, and Immortal Guardian did some shows with Exmortus. How did those dates with go over the summer? Guardian: Those went really awesome. The Exmortus run was really cool because we became bros with them almost instantly. We are pretty excited that we get to do a whole new run with them this fall. We are going to go from coast to coast so it will be pretty cool. The last day of that run is [September 28] in Vegas, which is the day our album comes out, so it’s going to be awesome release party. The Powerglove tour was super awesome. That was about 37 shows in 40 days and I had the best time of my life with those guys. I had been following them since the Myspace days. I opened up for them when I was a teenager, so it’s crazy to fast-forward and play lead guitar with them. I thought it was really special, despite the appendix surgery mid-tour. I had to get my appendix removed in Portland, Oregon, but we continued on and finished up all the Canadian and US dates. I had a blast, it was a lot of fun. I can’t wait to be on the road again with my own band, that’s definitely the most exciting. Dead Rhetoric: It seems you have a bigger push for your style of music outside of the US market. Is it frustrating to not have more of a foothold in your own country? Guardian: I totally agree with you on that. As much as I wish that the style of music that we play was as strong in the US as it is in Europe, I’m still very happy to be here in the US, and I’m grateful for the opportunities we have here. No matter where you are in the world, you are always going to find something that’s awesome and something that you wish was different. All of my international friends – I talked to my friend in Brazil, and I think the Brazilian heavy metal scene is one of the best I’ve seen. They absolutely love it, but they will vent to me about 1,000 things they wished they had if they lived in America. You can never have it all, but you just make it happen. But we are definitely planning on doing more overseas stuff with the music over the coming year. Dead Rhetoric: Could you talk about your dual instrument YouTube channel. What do you like about the guitar/keyboard combination? Guardian: I do a bunch of covers and different takes for some songs that people might now, from all different genres. My manager Brett and I have teamed up with it. We like to have fun with it and go to different locations and wear costumes to go with the theme of whatever song it is. I took a break over the summer due to the touring and other crazy scheduling things, but I’m definitely going to be hitting it pretty hard this winter. I’m excited to put out some new videos that we just filmed. Dead Rhetoric: What was it like to get on the MTV show Amazingness to perform? Guardian: It was definitely the most nervous minute of my life. They rolled me in, they said action, we went on, and within a blink of an eye it was over. I don’t even remember how I did it in the moment. I had to watch the tapes to see what I said and did – it was unreal. But I was very happy. Rob Dyrdek is one super cool dude and exactly what you would imagine him to be in person. He’s a really laid-back, awesome guy. They were really awesome to work with. It all started with an Instagram message and then I ended up on MTV playing Iron Maiden [laughs]. Thank god for the Internet! Dead Rhetoric: What musical background do you have? Guardian: I don’t have any formal training. I’ve never taken a guitar lesson in my life. I wish I had when I was growing up, but I just didn’t and couldn’t. I just kind of figured it out with the help of constantly asking people who were much better than me, with questions of “How do you do that? How do you do this?” I used to go to the public library in my school and print out tabs. I did whatever I had to do to learn my favorite licks. I encourage people to take lessons if they have that accessibility, it definitely helps. But with the power of YouTube and the Internet these days, you can pretty much figure it out all on your own. It’s pretty awesome. I was pretty fortunate to be born on the edge of when the Internet was becoming a thing and computers were getting better and I remember when Guitar Pro came out, you had a view that you could pull up the keyboard window, and that’s how I learned how to play my first stuff on piano. I never learned how to read sheet music, and I’m still not good at it, but you just follow the red dots on the piano. You play really slow and follow the dots – that’s how I figured out Mozart without reading sheet music. I also had those keyboards with the LEDs under them too. A lot of people ask if I have had training and that’s how I did it – I followed the light [laughs]. Dead Rhetoric: Just a lot of time and dedication then. Guardian: I did an insane amount of practice, but I had fun through the whole thing. If you aren’t having fun, stop doing it [laughs]. Dead Rhetoric: What does it take to have a balance between technicality and catchiness? Guardian: That’s a hard thing to balance. But at the end of the day, when I started doing electronic music in the project Fyer, I really learned that you have to bring back the shred and bring it to a catchy, memorable thing. It helped me ease up on the insanity of trying to be super-fast all the time. Over the years, you mesh the two ideas and make your own sound. My favorite guitar player is Santana. He doesn’t do any blazing fast stuff, but you can remember every single one of his solos. That to me speaks a lot more than being the fastest guy out there. Dead Rhetoric: What plans do you have going into the fall and winter? Guardian: As of right now, we are releasing Age of Revolution. Then we have the upcoming tour with Exmortus. Then we are going back into the studio and start tracking ideas for the next one. It’s winter, so it’s hibernation time. I’m going to lock myself up in the studio and shoot videos while starting to work on the new record. I’m also going to be working with Mobius8 and Guy Laliberte, the founder of Cirque du Soleil, on a new project that will be taking place in December. Follow our pages and there will be more updates about it. It’s going to be a pretty fun way to close off the year.